Mix water and sugar in a saucepan and bring to a boil. Add walnuts and boil for 2 minutes. Once done, drain water using a strainer and place walnuts on a cookie sheet to dry. Whip egg whites in a bowl until they become foamy. Stir in cornstarch and stir well. Heat oil in a deep skillet over medium high heat. Dip shrimp into batter then fry until they become a golden brown color. When done, remove shrimp from oil then place on paper towels to remove any excess oil. 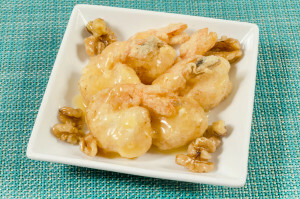 Before serving, toss shrimp with sauce and coat well. Add candied walnuts a serve.